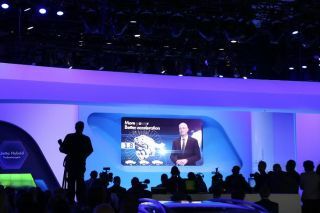 The theme at Volkswagen’s press event at the 2013 LA Auto Show was “Think Blue,” and it was all that blue on stage and on screen that posed a challenge for WorldStage in creating a live augmented reality experience for the automaker. WorldStage marked its third year servicing the VW press event at the auto show, but it was the first time that event producers George P. Johnson and Spinifex Group asked WorldStage to tap its technical knowledge to help create an augmented reality element where live images were enhanced with pre-programmed CG effects. What complicated the technique was the fact that portions of the augmented reality presentation showcased a blue vehicle shot against a bluescreen background and the presenter, VW USA president and CEO Jonathan Browning, wore a blue suit. The many blue-toned elements made live keying a challenge, and WorldStage performed a lot of tests to ensure that it could key out the blue background while retaining the blue of the car and Browning’s wardrobe. The resulting presentation was a suitable look at the VW lineup for 2014.